ArtLeaks is an international platform for cultural workers where instances of abuse, corruption and exploitation are exposed and submitted for public inquiry. ArtLeaks’ mission is to create a space where one could engage directly with actual conditions of cultural work internationally – conditions that affect those working in cultural production as well as those from traditionally creative fields. Furthermore, ArtLeaks is developing in the direction of creating transversal alliances between local activist and cultural workers groups, through which we may collectively tackle repression and inequality. While building on previous models that emerged in the highly politicized milieus of the 1970s and 1980s, such as the institutional critique practice of left-wing collectives, ArtLeaks seeks to expand the scope of these historical precedents towards international geopolitical engagement. One of the outcomes of ArtLeaks working assemblies and workshops was the establishment of alliances with international groups such as W.A.G.E. (NYC), Occupy Museums (NYC), Arts & Labor (NYC), Haben und Brauchen (Berlin), the Precarious Workers Brigade (London), Carrotworkers’ Collective (London), Critical Practice (London), and The May Congress of Creative Workers (Moscow). It is our strong belief that only an internationally coordinated movement would be able to expose and denounce exploitation and censorship in contemporary culture, and collectively imagine new types of organizational articulations. For the 2012 Historical Materialism Conference, members of ArtLeaks will present the outcome of their previous working assemblies which took place this year in Berlin, Moscow and Belgrade, and bring up for discussion the urgent need to establish the ArtLeaks Gazette (forthcoming 2013). This regular, online publication aims to be a tool for empowerment in the face of the systemic abuse of cultural workers’ basic labor rights, repression or even blatant censorship, and the growing corporatization of culture that we face today. Here we will address methodological issues in analyzing the condition of cultural production and the system that allows for the facile exploitation of the cultural labor force. We will try to relate methodology with concrete case studies of conflicts, exploitation, dissent across various regions of the world, drawing comparisons and providing local context for understanding them. This working group will develop and practice artistic forms of narration which cannot be fully articulated through direct “leaking”. Our focus will be finding new languages for narration of systemic dysfunctions. We expect these elaborations to take different forms of artistic contributions, such as comics, poems, drawings, short stories, librettos, etc. The conflicts and struggles in the field of creative education are at the core of determining what kind of subjectivities will shape the culture(s) of future generations. It is important therefore to analyze what is currently at the stake in these specific fields of educational processes and how they are linked with what is happening outside academies and universities. Here we will discuss possible emancipatory approaches to education that are possible today, which resist pressing commercial demands for flexible and “creative” subjectivities. Can we imagine an alternative system of values based of a different meaning of progress? In this working group we invite people to play out their fantasies of new, just forms of organization of creative life. Developing the tradition of different visionaries of the past we hope will trigger many speculations which might help us collect modest proposals for the future and thus counter the shabby reality of the present. This also includes practices which demonstrate alternative ethical guidelines, and stimulate the creation of a common cultural sphere. At the end of the working group session, we will present our findings to each other and come together for some final conclusions and future common aims. The editorial board for the first issue of the Gazette will consist of Corina L. Apostol, Vladan Jeremić, Vlad Morariu, David Riff and Dmitry Vilensky. Thanks to Historical Materialism for hosting us! Moscow anti-fascists Alexey Sutuga, Alexey Olesinov, Igor Kharchenko and Irina Lipskaya are currently in jail in connection with dubious and unproven accusations of “disorderly conduct.” Anti-fascists Alexandra Dukhanina, Stepan Zimin, Alexey Polikhovich and Vladimir Akimenkov are among those accused of involvement in “mass riots” on Bolotnaya Square on May 6 in Moscow, when riot police brutally dispersed an authorized opposition rally. Clear evidence of their guilt still has not been presented. The attorneys and comrades of the arrested activists believe this is being done to make it easier for police to prosecute anti-fascists and social activists. If guilty verdicts are returned in the Moscow and Nizhny Novgorod cases, a wave of similar “extremist” cases will follow all over Russia. Anti-fascists are today officially stigmatized as “extremists.” What is next? A court ban on anti-fascist views? We consider it unacceptable that an individual can be persecuted simply for political views and activities dedicated to the fight against racism. We demand a fair and partial investigation in these criminal cases, and prosecution of all law enforcement officers who abuse their authority and flagrantly fabricate criminal cases against civil society activists. 425,000 Greek voters sided with a neo-Nazi political party in the last election. Though Golden Dawn is implicated in a surge of violent attacks, and while its views range from the ridiculous to the downright racist, its popularity is rising by the day. What exactly is Golden Dawn, where does it come from, what is its true nature? What is the extent of their relationship to the police? And who are the people that vote for them? They are not being truthful in the least: Golden Dawn is a neo-Nazi organization, upgraded to a crowd-pleasing political party by riding on the wave of popular discontent with the established political system. Like their original source of inspiration–the German Nazis–the neo-Nazis of Golden Dawn have held views as varied as they are laughable, including mystical beliefs in the ancient Greek god Pan and other gods of Mount Olympus, as well as satanist beliefs dressed up in the theatrics of Black Metal music. They have also subscribed to wildly irrational or conspiratorial views, such as that the once number two in the German Nazi party Rudolph Hess was of Greek descent, or that Adolph Hitler roamed the streets of Berlin for forty days after his apparent suicide, only to ascend to the heavens at the end. Unfortunately, again like their source of inspiration, they can by no means be dismissed as plain charlatans, though charlatans they certainly are. In addition, however, Golden Dawn is responsible for a web of intimidation and fear that is ever intensifying, and its members have been repeatedly connected–though few of them convicted–with assaults, racial violence, beatings, extortion, and attempted murder. Read the rest of this disturbing and well-researched report here. Thank you to everybody who has helped support our campaign so far. 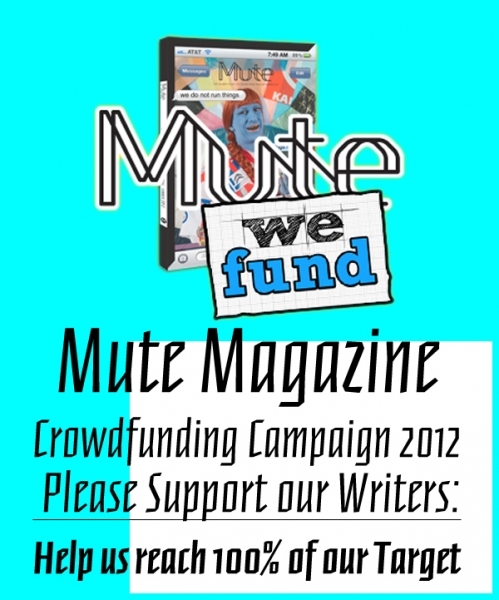 We’re now close to a third of our target sum of £5,500 for the Mute Magazine Contributors’ budget. Crucially, we need to reach 100% of our target in order to collect any of the donations that have been pledged so far. This means we need your help more than ever. It’s an all or nothing deal! — Help us reach the full 100% — if we don’t reach our total then we don’t get funded! – Please donate whatever amount you can by clicking on the project link below. We really would appreciate any contribution you are able to make. – Help us promote the campaign by sending news of the campaign to friends, mailing lists, blogs and any social media feeds you think are appropriate, saying why it is so important to continue to support Mute‘s contributors. In the face of increasing discrimination and violence towards the LGBT community in Russia, organizers of the Side by Side LGBT Film Festival remain defiant. Throughout the festival’s ten days, maximum visibility and openness will be sought in order to bring home to the public and the authorities the message of respect for the human rights of LGBT people in Russia. The major theme this year is local and global processes of the LGBT movement: we will explore discourses and practices relating to LGBT politics, activism, and sexual and gender identity rights at the local and global levels. In total, 37 films will be screen, and among the countries providing the focus are Russia, Uganda, China, Cuba, Chile and South Africa, places where LGBT movements are still in their infancy and face great opposition. A major topic of discussion this year is state-sponsored homophobia, drawing on the experiences of Uganda and Russia. Following the screening of the hard-hitting documentary and multiple award winner Call Me Kuchu, which documents the courageous efforts of David Kato and his team to overcome seemingly insurmountable obstacles in the fight for LGBT rights in Uganda, Stosh Jovan, a human rights activist from Uganda, will participate in the discussion, along with Igor Kochetkov (LGBT Network) from Russia. Also joining in the debate are Andrey Tolmachev a representative of the office of the Ombudsman for Human Rights in St. Petersburg, and Robert Bierdron, Member of the Parliamentary Assembly of the Council of Europe. Other guests include Eytan Fox (Israel), Yang Yang (China), organizer of the Beijing Queer Festival, and Michiel van Erp (Netherlands). In cooperation with the Swedish documentary film festival Tempo, Side by Side will be screening the work of filmmakers Sara Broos (For You Naked) and Mette Aakerholm Gardell (Not a Man in Sight). Both directors will take part in Q&As following the screening. As part of the festival, Side by Side will be launching an interactive campaign, Stop Homophobia in Russia! Details to follow. The complete festival schedule can be viewed here. Winkleman Gallery is very pleased to present Homosexuality Is Stalin’s Atom Bomb to Destroy America, our third solo exhibition by New York-based artist Yevgeniy Fiks. Taking its title from a 1953 article by the Cold Warrior and pundit Arthur Guy Mathews, this exhibition explores the historical and ideological links between anti-Communism and homophobia in the United States, as well as the intersections between Communism and sexual identity as it played out during the 20th century. Works in the exhibition range from dry factuality to humor, and farce, and posit the 20th century queerness as the shared Other of the Communism-Capitalism dichotomy, while tracing the uneasy yet tangible historical links between the early 20th century Communist activism and the gay rights movement of the second half of the century. Works in the exhibition include Stalin’s Atom Bomb a.k.a. Homosexuality, a series of prints that highlights paranoid anti-communist and anti-gay quotations from American politicians and pundits of the era. Another series, Joe-1 Cruising in Washington, DC includes photographs of a six-foot cutout of the 1949 Soviet nuclear test explosion RDS-1—codenamed in the US as “Joe-1″—posing, in 2012, at locations that had been popular gay cruising sites in Washington D.C. circa 1930s-1950s. The Security Risk Map of Manhattan maps gay cruising and Communist meeting sites of the 1930-1950s, presenting an open ended question about the “conspiracy” and overlap between the two groups. Yevgeniy Fiks was born in Moscow in 1972 and has been living and working in New York since 1994. Fiks has produced many projects on the subject of the Post-Soviet dialog in the West, among them: Ayn Rand in Illustration, a series of drawing pairing descriptive text from Atlas Shrugged with uncannily complimentary Soviet Socialist Realism classic artworks; “Lenin for Your Library?” in which he mailed V.I. Lenin’s text “Imperialism: The Highest Stage of Capitalism” to one hundred global corporations as a donation for their corporate libraries; “Communist Party USA,” a series of portraits of current members of Communist Party USA, painted from life in the Party’s national headquarters in New York City; and “Communist Guide to New York City,” a series of photographs of buildings and public places in New York City that are connected to the history of the American Communist movement. Fiks’ work has been shown internationally. This includes exhibitions in the United States at Winkleman and Postmasters galleries (both in New York), Mass MoCA, and the Philadelphia Museum of Modern Art; the Moscow Museum of Modern Art and Marat Guelman Gallery in Moscow; Sala de Arte Público Siqueiros in Mexico City, and the Museu Colecção Berardo in Lisbon. His work has been included in the Moscow Biennale of Contemporary Art (2011, 2009, 2007 and 2005), Biennale of Sydney (2008) and Thessaloniki Biennale of Contemporary Art (2007). For more information, contact Edward Winkleman at 212.643.3152 or edward@winkleman.com. Image above: Yevgeniy Fiks, Joe-1 Cruising in Washington, DC (Monument Grounds), 2012, photograph.